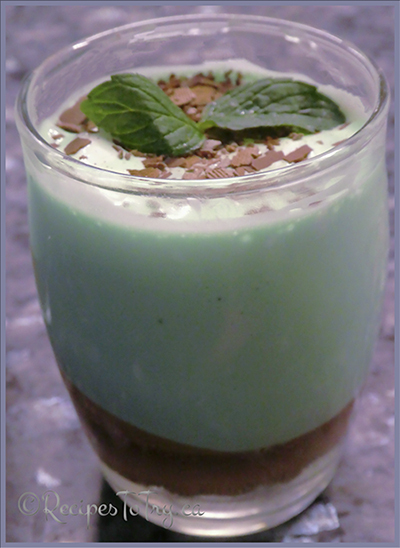 Minty, marshmallow grasshopper parfaits with an Oreos cookie crust layered with a chocolate ganache is the modern version of the retro grasshopper pie dessert. This make-ahead dessert is great for that unexpected company or holiday meal. Make the Ganache (see below for directions) as this will be added on top of the cookie crust. In a food processor chop the complete cookie until coarsely chopped. Spoon 1 tablespoons of ground Oreos into each mini dessert glass. Use the back end of a wooden spoon handle to press and firmly pack the cookie crumbs. Add the ganache on top of the cookie crumb base and chill while making the parfait filling. In a large bowl, whip marshmallow fluff, Cool Whip, crème de menthe, and green food coloring together until well-combined. Set in freezer for 15 minutes. Spoon the grasshopper filling into each mini glass. Sprinkle with chocolate shavings. Freeze for 2 hours to set. When ready to serve, serve straight from the freezer. Garnish each mini glass with mint leaves. Heat the cream: Pour the cream into a small saucepan and place it over medium-low heat for a few minutes. Keep an eye on the cream — it's not necessary to boil or simmer it. It just needs to get hot. The cream is ready when you can place a finger in the cream and keep it there for 3 to 4 seconds. Turn off the heat and remove the cream from the stove. Chop the Chocolate: While the cream is heating, chop the chocolate into fine pieces (a food processor works great for this).